Storage is where your data lives and is needed to run your workloads on premise, in a colocation, Cloud or on the move. Many advances have been made in data management capabilities such as virtualizing the storage software layer and utilizing Cloud/hyper-converged hosting platforms. However, the software used to run storage systems continues to rely on traditional RAID and data management methods. This approach continues to impose limitations on storage performance and agility. Next generation storage software must be built from the ground up to provide better performance and flexibility. 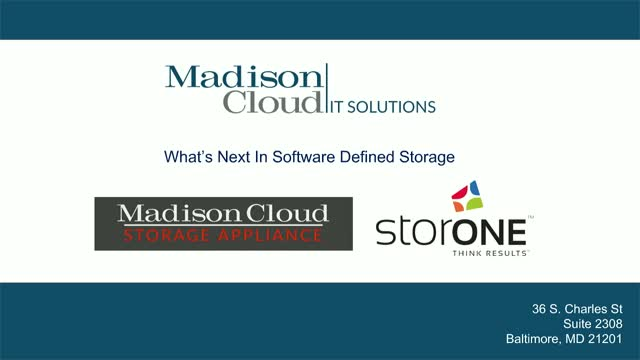 Madison Cloud has teamed with StorONE to deliver new software-defined storage capabilities with an entirely new software stack. Imagine using the same drive pool to simultaneously deliver block, file and object storage services. Forget the complexity of managing RAID groups and lengthy rebuilds. Access the full IOPS potential of your NVMe/SSD/HDD drives. Mix & match different drive types and sizes in a single system. Take as many snapshots as you like, without suffering from performance degradation and consuming valuable drive space. Use the largest available disk drives without RAID overhead and collapse your data center footprint in weeks, not years. Simplify storage procurement by flattening complex pricing structures into a single pricing tier that provides Petabyte scale block, file and object storage in a single platform, for as little as $0.01/GB/month. Your new simplified data management fabric now delivers what you need, when you need it, in a 100% utility model. Join us to learn how Madison Cloud and StorONE can deliver the data management platform you always wanted.